Our number one goal is to return patients to their prior level of function as quickly as possible. Rehab Road is designed specifically for short-term recovery following an illness, injury or surgery. For Hospital Transfers: Contact your Social Worker / Discharge Planner and request a transfer to Meadowbrook Healthcare. Our Admissions Department will make the necessary arrangements for your transfer. Upon arrival, a representative from the Admission Department meets with patients to review your paperwork and payment / insurance information. Patients are then evaluated by members of their medical care team and an individualized care plan is generated and put in place with one goal in mind; returning the patient home to their prior level of function as quickly as possible. Patients who successfully meet their rehabilitation goals are discharged home. Our licensed therapists may conduct virtual tours of patients’ homes and make suggestions for the installation of necessary equipment such as grab bars in the bathroom and ramps in place of stairs. Your Care Plan Team is comprised of members from several departments within our facility who work in concert to ensure the most efficient and successful recovery possible. Through weekly team meetings, our professional staff develops and monitors patients’ individualized progress and makes any necessary adjustments to the plan of care. Your Morning: Bathing, Dressing, Breakfast, Therapy and quiet time. Your Afternoon: Lunch, Therapy, Activities, and rest time. Your Evening: Dinner, Family visits, walking program and personal time. Our Activities Department coordinates a wide variety of activities including entertainment and spiritual enrichment for your enjoyment throughout your stay. 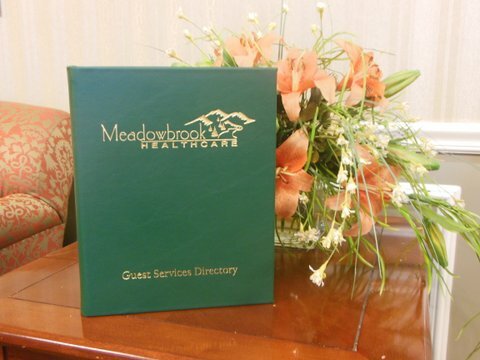 Medical appointments related to your stay will be approved by and scheduled by our staff. Per the request of local area physician offices, family members are required to be present throughout the appointment; to offer assistance, to aid in the sharing of accurate information and most importantly, to be present during the decision making process of the appointment. Proper attire for outdoor weather (coat, hat, gloves, etc.) – as many patients need to go outside for doctors’ appointments.